I've really let this site slip, so just gone through and updated some info on pages. Lots has happened in the last 18 months. I now have multiple Amazon best sellers to my name, and they're an excellent way to support me and my work, so check them out on Amazon. So a HUGE thanks to Fundamental Changes who stepped in and took care of me when other people were turning away. Outside of this, my Patreon page has almost 100 people, and is a huge help in making ends meet from month to month. We've created a great community over there of talented and aspiring young learners and transcribers, so if you want to join us there, check it out - it's a LOT of fun! Finally, the #GuitArsoles podcast is coming along nicely - so subscribe on your podcasting app of choice, and listen to us rage on all things music from week to week. As always, thanks so much for all the support! (19/11/2016) - Country Guitar For Beginners Book - OUT NOW! After months of work, my first book is finally out! This marks a monumental step in my career, as I'm finally a publisher author! That's an incredible feeling and I'm very proud of how the book turned out, so please do take a look at it here. ​Over the course of the 100+ pages, I'll take you from creating basic backbeats in country rhythm playing, all the way through playing solos with licks outlining chord changes. With over 170 audio examples, and even more musical examples, I do believe that there's not a more detailed manual on the subject. Another long delay between posts, but I'm back with some big news! I'm now on Patreon! If you're unfamiliar with Patreon, check out the link and see my story, why I'm there and what I hope to achieve by being there. Essentially, I'm hoping that I'll be able to bring you unfiltered content and tutorials on Youtube, along with interactive transcription events and lessons. I'm really excited to see what the future holds here, so if it's something you want to be a part of, click the link and check it out! ​You can also stream it on Spotify if you're not into buying music - just give it a spin and share it with your friends! 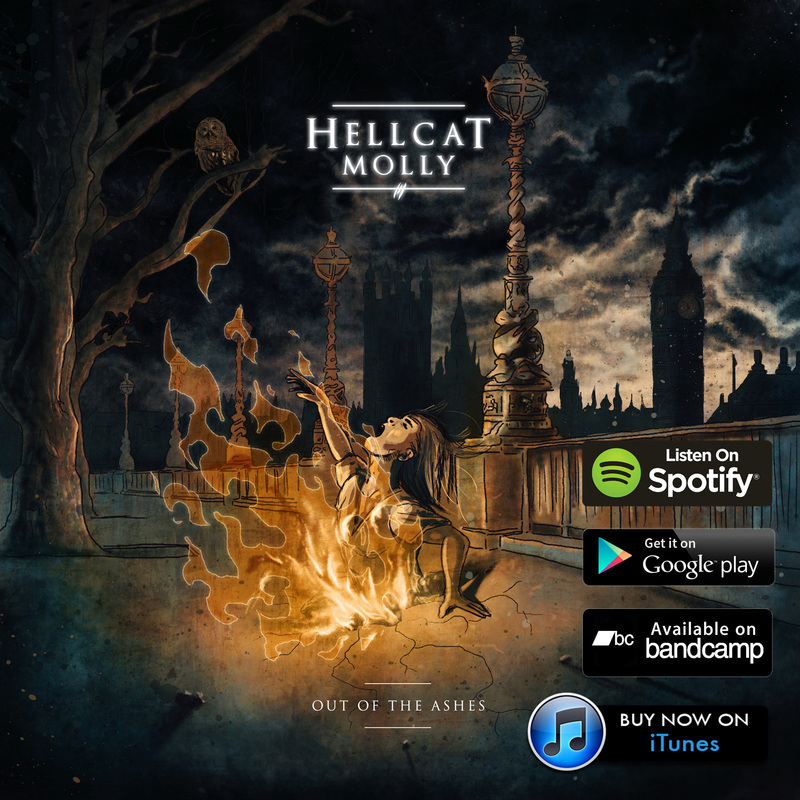 At long last the official release date for Hellcat Molly's debut album, Out of the Ashes, has been announced as the 23rd of December on Bandcamp, with the record seeing a further release on December 27th on iTunes, Amazon, Google Play, Beats, Shazam, Spotify and many others. The album can currently be pre ordered on BandCamp where you'll get 3 tracks now if you want to buy the record, or you can just stream them to see what it's all about - so why not give it a spin? You can now order this killer Out of the Ashes shirt designed by Joe Latham of Look Happy. His work is absolutely wonderful and he's been an absolute pleasure to work with - if you need anyone for design, he comes highly recommended. The high quality screen printed shirt can be ordered on the album indiegogo page - the perfect Christmas present perhaps? What I can say is that this makes a huge difference to me, so thanks again for your continued support. This design is limited to just 50 pieces - certainly not cheap making so few shirts with so many colors printed on them.... but lesson learned! Get one while they last! ​The album is in mixing now - expect news soon! It should come as no surprise that I enjoy writing. I like to think I'm good enough at it that someone might enjoy reading it, after all, I'm paid to do it. I'm also a big fan of social commentary, truth, offensive satire and all things entertaining. I've admired the work of Maddox, Jim Sterling, Sean Locke, Frankie Boyle, Jim Jefferies etc for years, so I thought.... why not write a blog? You can now check it out here! Give it a spin, and try to enjoy it. If you leave offended, entertained and self reflective.... I've done my job! On a side note - to keep you up to date with all postings, I've set up a newsletter (excuse the pop up!) as all these hours of work feel lost if I'm having to find you on social media time and time again. Please consider signing up to the newsletter and I'll email you once a month or something and link you to new things to read - along with other cool stuff! I'll never sell your info or spam you.... so why not? You'll also learn 3 solos from the upcoming record... which should be fun! After an amazing couple of months on IndieGoGo, our campaign is coming to an end and is fully funded! We've been working hard and are now unveiling the first single to keep you all interested while we finish the album - thanks so much for your support so far! Levi Clay - Hellcat Molly - Break - Official Single from levi on Vimeo. 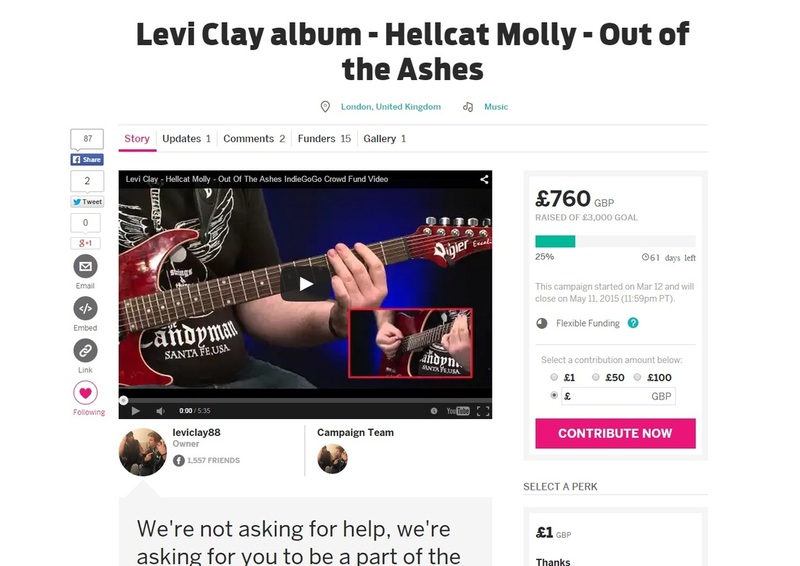 This morning I finally launched the crowd fund for my first ever album, Hellcat Molly - Out of the Ashes. It's a scary moment in my life as there's a lot of change happening. There's gains, loss, risks and rewards and every song on this album covers that feeling. It's a personal statement and something I just feel I need to share with the world. We've been live for half a day and we're already at 25% - with your help I hope we can make it to 100%! Please check the video out, read the page, donate and share it with your friends because I just can't do this without you! It's an amazing feeling to announce that I'm officially part of the D'Addario and Planet Waves family. Over the years I've adamantly stood by the idea that "strings are strings" and that as long as you're paying the same price as any other brand you'll get a quality product. I really did feel that way until D'Addario kindly sent me a box of their new NYXLs which are the best strings I've ever used. Outside of the strings, they've sent me various products that I also love like the micro tuner, the XLR8 string cleaner, cables, string winders etc. It's an honor to officially be a part of a family I've admired for many years! It's a great pleasure to announce that in early 2015 I'll be teaching for a full day alongside my friends and colleagues Sam Bell, Lewis Turner and Tom Quayle down in Kent. 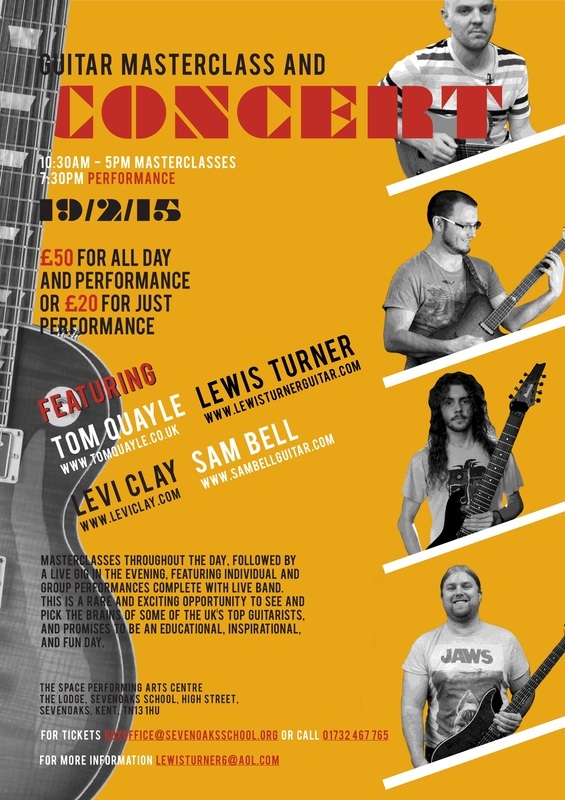 You can expect it to be a day of technique, theory, composition and all things music and I'm sure that between the four of us, we'll be able to take your playing to the next level, so don't miss it! For fans of my first video, you can expect the same level of detail, but this time applied to the melodic minor scale and the use of it as a colour on a minor 7 chord. This is presented in the easiest way possible so no matter what level you're at, you can get going right away. To go one further than my last DVD I took the time to make a proper backing track this time with some non diatonic chord changes for you to apply these licks to, along with a series of exercises on fretboard visualization and modulation skills. I'm so happy to be sharing this with you as we spent a lot of time working on this material. We've got a ton more in the pipeline but everyone is busy with their own projects that this felt like it was going a bit stale, so I decided to put it up for you all to enjoy. (04/10/2013) - Easy Blues Fusion DVD Out Now! I'm blown away with the level of support we've had on this one, so expect volume 2 soon enough! On the DVD we look at a blues in Bb and focus on outlining dominant 7 chords more tightly, so arpeggios, mixolydian scales and chord tone targeting across chords in 3 different keys. Check out my ask.fm page where you can ask me anything you like, or just read answers to other questions people wanted to ask. It really is criminal how long it's been since I've given you all an update - so here it finally is! Work has been crazy, from LickLibrary to Premier Guitar, London to Romford, sunny Italy to the equally sunny California things are real good. The gear has switched up a bit, Dr Z, Gibson and Vigier are all in regular use now, along with some unbelievable support from D'Addario, TC Electronic and Seymour Duncan. Check out some of the new pages linked below and expect more coming, I promise! It's with great pride that I can announce I'm now part of the Wampler family. Brian Wampler is one of the greatest pedal makers of all time and a real innovator. It really does highlight what a real endorsement is all about - I advertise this product because I genuinely think they rock! Check out this video which Wampler are now using as promotional material for the Brad Paisley signature "Paisley Drive"
I'm finally shooting HD videos that look good! Here's a tribute to the great Scott Henderson. As most of you know, he's one of my all time favourites. This track is from Scott's second solo record "Tore Down House" and features what I consider to be the greatest recorded solo ever! Go check it out. Swing by Live 4 Guitar to see my latest article on diminished scale usage. The final's have finally come around and although I didn't make that final 10, It was great to go and hang out with my good friends Nico Schlimann, Martin Miller, Jack Gardiner, Frank Pearl, Ignazio Di Salvo and many others. It was a great opportunity to see old friends and new - cheers guys. There was a chance for me to get up on stage and play and here's a pic of me rocking out on the mighty Tom Quayle's Suhr standard. Hopefully we'll all meet up again soon! My new column at Live4Guitar has just gone live - give It a look, drop me a comment and share it with your friends! It's a real honour to play such an active role in such a great site. The idea is really simple; everyone is equal and everyone should have the same platform to show the world who they are as a player. Take a look around the site and you'll find places where you can sell your own lessons, backing tracks, music and a great forum with some awesome players present. Now I really do need all of your help. Its a new system that eliminates down voting, just pick your 3 favorites! I would really appreciate it if you could head over to guitar idol and vote for me! There are lots of things in the pipeline now, but making it to the final of Guitar Idol would truly be the icing on the cake. How does the idea of a week's intense tuition from Martin Goulding, Andy James and Levi sound to you? From intense shred technique to the application of theoretical concepts and outside playing. If you want to advance on your instrument FAST, then this is the course for you! (12/11/2010) - Suhr Mega Jam Transcription Package Available NOW! I have just finished this package for the guys involved, so head over to Martin's website and buy buy buy! Its not often you can buy a product and really support the artist, when you buy this the money goes straight to the guys involved! The package includes 13 pages of transcription in both powertab and pdf, and a 6 page analysis of the progression and each solo highlighting scale choices so you can have a go yourself! 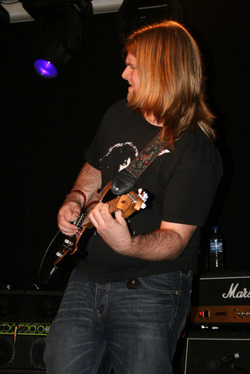 (9/11/2010) - Levi Wins Steve Vai Contest! Thanks to your support I will be closing the Steve Vai masterclass this coming Sunday at Guitar Nation!